The Bible calls believers to spread the word of God wherever they go. For some people it's easy for others it's much harder. 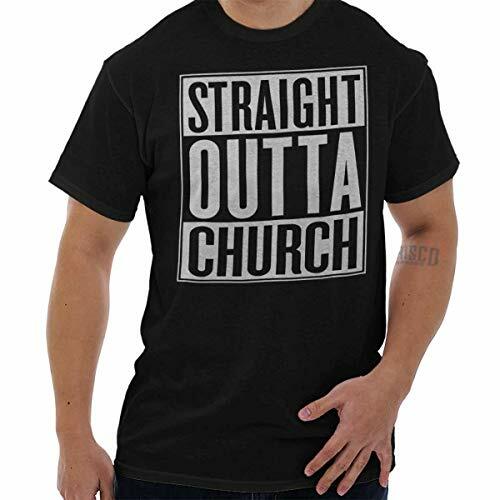 With this new 'Straight Outta' design you can multiply your Christian ministry wherever you go, represent Jesus Christ and loudly proclaim your belief in the One True God without even having to open your mouth. Jesus says that Whoever denies Me before men, him I will also deny before My Father who is in heaven use this fashoinable design to confess Jesus' name and he will confess yours! This unisex graphic t shirt is a full cut regular adult spec and has no size seems and is not tapered. This type of shirt is for a better looser fit, than the new tight fitted types of shirts. Please review sizes before you buy, we want you to be satisfied with your purchase! This is the most basic, most purchased standard 100% cotton t-shirt for adults. If you have any questions about this product by Brisco Brands, contact us by completing and submitting the form below. If you are looking for a specif part number, please include it with your message.